It took two printers to replace Canon's beloved i9900, the 13x19-inch printer whose lifespan extended well into the PIXMA era. But Canon's two new PIXMA 13x19 printers carry the torch well. The Pro9000, shipping since October, is an 8-color dye-based inkjet while the Pro9500, due in 2007, is a 10-color pigment-based inkjet (with a second black and green-yellow cartridge). Both enjoy the same 4800x2400-dpi FINE print head technology that made the i9900 such a fast printer, although the Pro9500 has a three picoliter droplet size rather than the two picoliter of the Pro9000. And, of course, different inks are used from the i9900 -- and each other. This review is based on the test unit Canon shipped, which was not a production unit, but was packaged much as if it were. Out of the Box. All the tape is easy to find and everything is nicely protected. Note that you'll have to supply your own USB cable to print either directly from a PictBridge-compatible camera or your computer. If there's a cure for Buyer's Remorse (which afflicts us whenever we use a credit card), it's installing a Canon printer. It may sound ridiculous, if you've never had the pleasure. But a pleasure it is. Install Instructions. Clearly written, helpfully illustrated, you can't go wrong and it takes only minutes. Bravo! The first thing you see when you open the box is a nice big installation poster with large columns across the sheet for each step. And there are only six steps, five of them on the front side, all profusely and clearly illustrated. The first one is to unpack the printer, checking the contents and removing the orange tape whose job its was to keep moving parts still during transport. Cartidge. Clearly marked No. 8 Black (top), with the business end (middle) and the brains (bottom). The second invites you to plug in the power cord and get inside to remove a plastic cage that secures the print head holder during shipping. The holder moves to the center and you're advised to write down the serial number you see inside the printer. Unlike a lot of installation posters, Canon takes pains to point out little things along the way, like which buttons to press to open something or what happens if you take a phone call for 10 minutes (the holder goes into hiding). Next you rip open the foil package that contains the print head itself, being careful to avoid contact with the nozzles. But take a look at them on the underside of the print head because they're the big reason the printer is so fast. The head slips into the holder and is locked into place. Inks Installed. A lovely red glow tells you the inks are ready to get to work. Ink tank installation is kind of fun -- and we don't say that about many printers, most of which seem designed to give you the feeling you are destroying your investment. You rip off a plastic wrapper and twist off a plastic cap and simply pop the tank gently into the print head until it clicks in the spot designated for that particularly color. The cartridge lights up in red when it's seated. Then you close the cover and front tray and open the paper support extension and front tray extension (which resemble the i9900). At this point, you turn off the printer, connect a USB cable from your computer and load a couple sheets of plain paper for print head alignment. Here's where the road diverges depending on your operating system, but the game's the same: install all the software. Mac users turn the printer on right away, but Windows users wait until prompted. Installation from the CD was simple. Just load it and press the Easy Install button. You'll be prompted to perform the print head alignment, but that's about it. In a few minutes, you have the printing applications and drivers you need. All you have to do is restart. Autofeed Setup. Looks a lot like the i9900. Single Sheet Setup. Lift the output tray and open the back. The Pro9000 is much larger than its predecessor, the i9900. It's also a squared off design, attractive in its own right. 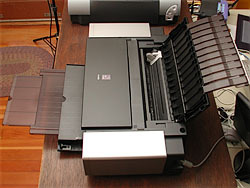 The front tray can be opened to catch the printer's output. But it can also be pulled up at a 45-degree angle and reseated a bit higher to feed thick stock into the printer. When you set it to be a feeder, you also open the back of the printer and release two plastic wings that extend out the back door to support 13x19 sheets. This gives you a straight-through paper path for thick media. Like other front-feeding designs, you have to manually slip a single sheet of paper into the printer and line it up with a silk-screened target. We find that a little too analog, but it works fine in practice. The trouble is that the path can't be obstructed by any physical guides because you are only placing the paper where the printer will load it before printing and ejecting it. Line It Up. When the printer signals it's ready, you slide the big sheet in as far as the silk screened mark. On the Pro9000, you also have to tell the printer you are loading paper by pressing the feed button, waiting until the printer grinds away for a few seconds and flashes its power light to tell you it's OK to slip the sheet in. When you've done that, you press the feed button again to start printing. And you'd be wise not to do this until the driver asks you to. Otherwise, you'll get an error about paper size. 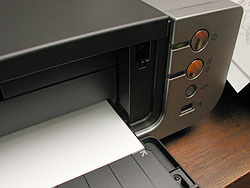 On the bottom of the printer along the back edge are two wheels that spin freely when the printer is flat. Lift the front of the printer and you can roll it into place or just forward a bit to make a little more room for the front feed option. Very nice touch. On a printer this big, it's nothing short of an anti-hernia device. The USB connection is indeed 2.0 Hi-Speed but around here that doesn't quite make up for the inconvenience of connecting yet another USB device. The i9900 offered both USB and FireWire and we miss the FireWire if only because it's a much less trafficked interface than USB. An Ethernet option would let you take advantage of that free Ethernet port on the wireless router you use to share your Internet service. Details. The control panel (left), the roller and power connection (middle) and USB port (right). There's no LCD screen (PictBridge operations are controlled through the camera's LCD) and no card reader. The reason you buy this guy is for the 13x19 prints. 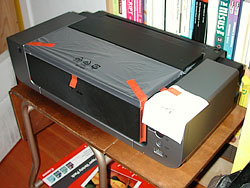 With the hardware set up and the software installed, the printer is ready for use. But we've found many options are often hidden in the driver software. Let's take a look at a few you might miss if you don't hunt them down. Vivid Color. Explaining its Vivid Color technology (http://www.canon.com/technology/detail/bj/vivid/index.html), Canon notes the trend to "emphasize the faithful reproduction of colors (sRGB) on monitors." Calling that "an impediment to optimal color reproduction," Canon developed Vivid Color, which "determines the most suitable colors for each particular image and then makes adjustments using a proprietary method. As a result, the potential color range is expanded to include bright cyans and greens, which do not appear in the conventional sRGB color range." Vivid Color parallels the tendency of digicam manufacturers to bump up saturation, as Dave often notes in his camera reviews. Our experiments with it suggest it's intended for sRGB images only. Printing from Adobe RGB color space, we disabled it. Ink Level Information. Also in the printer's Utility program, the Ink Level Information lets you see how much ink remains in each of the six tanks. ICC Profiles. Canon provides a number of printer profiles designed to optimize printing with the Pro9000's ink set on different Canon papers. 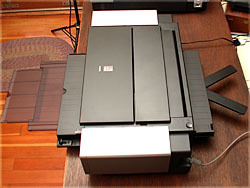 Canon's top end Photo Paper Pro, for example, is also known as PR-101. When printing on this sheet, you'd select the PR1 profile and turn off any color handling in the printer driver's Color Options panel, setting Color Correction to None. Profiles for Matte and Photo Paper Plus Glossy are also available. Multiple versions are also installed (PR1, PR2, PR3, for example) indicating the quality setting (with one the highest). And since the Pro9000 can print on a variety of media, new profiles are included for Museum Etching, Photo Rag, Premium Matte and semi-gloss. Easy-PhotoPrint. Also part of the software installation, Easy-PhotoPrint is a printing application that actually does make printing easy, especially batch printing. We had dozens of snapshots we wanted to pop out of the printer but only letter-size photo paper. So we told Easy-PhotoPrint 1) which images we wanted to print, 2) on what size and kind of paper and 3) how we wanted them laid out (four to a sheet). No problem. And they looked great, too. A Photoshop plug-in is also installed that makes it just as easy to print from Photoshop. Large print heads make printing fast and the Pro9000's very large head does indeed print quickly. The small droplet size and high resolution deliver very sharp, detailed prints at the same time. Because the paper swells when the ink wets it, it encapsulates the dye as the ink vehicle evaporates and the paper shrinks back to its dry state. This can go a long way toward obscuring any dot pattern laid down by the print head (and it does lay one down -- a very fine, frequency modulated screen). Even using a 10x loupe, we weren't able to see the droplets even in the highlights on glossy photo paper. Print speed was indeed snappy and the printer was smart enough to warn us if we'd forgotten to drop the output tray down. The one exception to print speed we found was printing with the Grayscale box checked. That limits the Pro9000 to just the black ink cartridge with significantly fewer nozzles firing and, consequently, much longer print times. Even better, there's something about Canon's dye-based color prints that just dazzles us. We're so pleased by the first print that we never seem to make any adjustments. And the Pro9000 lives up to that reputation. 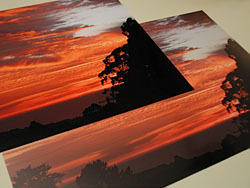 The prints -- compared side-by-side to the same image printed form HP's pigment-based B9180 -- were stunning. There's an explanation for that, of course. Canon calls it "Canon Digital Photo Colors." The company uses panel tests and studies to divine "the colors people prefer" based on actual human perception. "Our efforts to create gray shades that are as neutral as possible achieve colors such as skin tones with low-chromatic colors pleasing to the eye," the company explains. "Improved contrast was made possible by our improvement of gradation curves. Raising color saturation allowed us to express skin tones and backgrounds more vividly. Canon's inkjet printers were rated highest in panel tests with models reflecting these improvements." The one picoliter droplet size "successfully reduce graininess in every area of an image, from highlights to mid-density and dark areas. Because dot placement is also controlled at the micrometer level, noise is eliminated even in half-tone areas, which contributes further to outputting extremely smooth images." But the smaller droplets have their technical hurdles, too. The smaller they are, the more likely misplacement will affect image quality and the effects of air resistance (especially in the air currents created by the rapidly moving print head) are more pronounced. As noted above, Canon's FINE technology addresses both concerns, thrusting a very precise amount of ink downwards with a bubble generated at the tip of the nozzle "and the energy created when this bubble is formed is efficiently converted into a powerful ejection force." With this generation of 13x19 printers, Canon gives you a choice between its ChromaLife100 dye-based ink system in the Pro9000 and the new Lucia pigment-based system in the Pro9500. We haven't tested the Pro9500 but we've had the pigment-based HP B9180 here for a while. The comparison is interesting. While Wilhelm Research (http://www.wilhelm-research.com/hp/PhotosmartProB9180.html) touts a print permanence rating over 230 years for the HP on HP's Advanced Photo Paper Glossy, results for both the ChromaLife dyes and Lucia pigments are only preliminary. But Wilhelm reports, "A review of preliminary test data indicates that prints made with the Lucia pigmented inks and select Canon photo and fine art papers printed with the Pro9500 will have WIR Display Permanence Ratings in excess of 100 years for color images and significantly beyond that for monochrome images." Considering that traditional chromogenic (color-coupled dye) color prints have a life expectancy of 22 years for Kodak Ektacolor Edge 8 paper and 60 years for Fujicolor's Crystal Archive paper, both multilayer gelatin-coated RC sheets, any of these big inkjets exceeds expectations in the art market. And for the rest of us, the question boils down to just how long you expect to live. At 100 years, you're making lifetime color prints, assuming you store and display them properly. So the old dye vs. pigment debate would seem to be less compelling than it was just a year ago, say. We're free to return to the real issue: the print. And here the question of which paper to print on threatens to resurrect the old debate. Epson, as far back as its P2000, supported all sorts of papers, but that's the anomaly. To get good results from a dye-based inkjet, you had to print on a swellable glossy sheet that encapsulates the dyes in the paper surface. Part of what may be taking Wilhelm a while to evaluate the new generation Canons is that they support more papers. 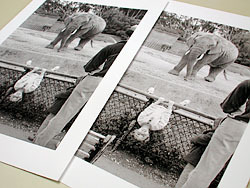 You can now print on Fine Art sheets that offer Museum Etching, Photo Rag, Premium Matte and Semi-gloss surfaces. Only the last of those resembles the smooth coated surface of a glossy sheet. The others have rough to smooth uncoated surfaces that cry out for black and white prints but show a vibrancy with color images that surprised us. Getting the ink onto (even "into") the paper is the job of Canon's MicroFine Droplet technology (http://www.canon.com/technology/canon_tech/explanation/fine.html), which resembles Hewlett-Packard's thermal inkjet technology but differs significantly from Epson's piezo technology. 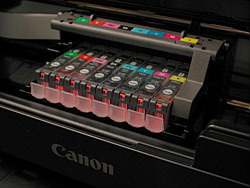 According to Canon, "To deliver faithful image expression, ink droplets must be extremely small and precisely distributed. As ink droplets become microscopic, however, image quality is affected by such problems as uneven droplet size and placement on the paper. While conventional inkjet printers have compensated by employing a multiple-pass printing system, in which the print head makes several passes for each line, this significantly adds to the printing time." Canon developed its FINE (Full-photolithography Inkjet Nozzle Engineering) technology to combine "an ink-ejection mechanism based on a unique concept with an innovative ink-nozzle-manufacturing method." Conventional inkjet processes like Bubble Jet and piezoelectric apply pressure to ink inside the nozzle before ejecting it from the tip of the nozzle. But fluctuations in volume and direction can be caused by ink temperature and viscosity. FINE uses a heated tip in the nozzle to control those fluctuations, generating a bubble of ink that is completely thrust downward. Canon is able to pack over 6,000 nozzles on a printhead using semiconductor production technology. 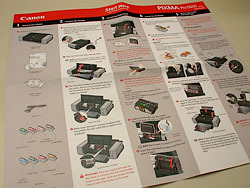 We printed a number of images on the Pro9000 but several were especially instructive. We wouldn't recommend the Pro9000 as a black and white printer with the Pro9500 in the wings featuring two black inks, the HP B9180 offering three and Epson long the leader in the field with even more blacks via third-party solutions. If you want to print black and white, it's worth outfitting a printer to do just that. Black & White. Just black using the Grayscale option (left) and full color printed as black and white (right). But you may want the occasional black and white, so we wondered how the Pro9000 would do. We scanned an ancient 35mm image shot under overcast skies, a fairly high-key image without a lot of deep blacks but detail in the shadows. We have a 16x20 silver halide print of this image and wondered if we could duplicate what we did in the darkroom. We had a very large scan, plenty of detail, and printed it with and without the Grayscale option checked on Canon's premium matte uncoated but smooth paper (which must be fed through the front). Without the option, the image printed using all the inks to render black and white image very quickly but with a slight warm color cast. With grayscale checked, the printer used only the black cartridge, printing much more slowly but with no noticeably cast. Detail was superb. With sharpening, we even surpassed the silver halide print. Only under a 10x loupe were we able to detect the droplets and, frankly, they were finer than the grain on our 16x20 print. We missed the richness of a multiple-black printer, but the results were more than serviceable compared to the original print. Dye vs. Pigment. Pro9000 dye print (top) is more vivid with darker blacks than the HP B9180 pigment print (bottom). Next we considered a vibrant orange sunset with blue sky above the cloud cover with a very dark foreground, almost a silhouette of trees. We had a print of this from the pigment-based HP B9180 that we liked very much, although we felt the orange was a good deal less vibrant than it might have been. We were right. With dye-based inks, the orange was vivid again. But to our surprise the black foreground was much deeper, too. The Canon far surpassed the HP for this particular image. And the HP was printed on glossy paper, which should have flattered its dynamic range. 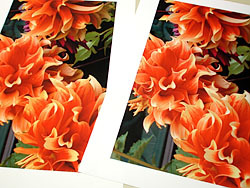 Finally we compared semi-gloss to photo rag with a shot of three yellow and orange dahlia flowers dancing across a 16:9 image. It seemed an odd aspect ratio for a 13x19 sheet, but printing it with a wide border (1-3/8 and 1/3/4 inches) only made it seem intentional. You can do 16:9 very well that way on 13x19 paper. Textured Paper. Photo rag (left) compared to semi-gloss (right) are remarkably similar. We printed from Photoshop with application-managed color (the Canon driver didn't do any color conversion) using the profiles for the two Canon papers we tried: the semi-gloss and photo rag (with a slightly uneven surface). Uncoated sheets soak up a lot more ink than glossy sheets, but we wondered what advantage they offered in color printing. We prefer them for black and white printing, but color? We expected to see the inks absorbed by the photo rag paper, delivering a slightly higher-key image. No dark color as dark, the highlights brighter. But the effect was hardly noticeable. The two images side by side two days later looked identical, except the photo rag sheet had no sheen. Studying it carefully from an angle, we could detect a slightly less dense black but highlights were just as brilliant. Canon's new PIXMA Pro9000 dye-based inkjet had a tough act to follow in the i9900. But it brings down the house with vibrant color, fast printing and versatile media handling that challenges not just the i9900 but pigment-based 13x19 printers. We miss the FireWire option of the i9900 but once again enjoyed a straightforward installation process. We also missed the compact footprint (in comparison) of the i9900, but that's the trend in 13x19s (the HP B9180 is much larger). At least the Pro9000 has wheels to make it easy to balance its weight and move it around. But the biggest drawback to the Pro9000 is image quality. Looking at these gorgeous 13x19s we know we're just going to spend a small fortune at the frame shop and, right after bringing them home, be calling our real estate agent to see if there are any small mansions with a lot of wall space going for a song -- or a set of prints. That's probably all it would take!